~To many, it seems like it was a long time ago. Super Bowl XLV was five long years ago, to some. But to those Packer fans over 40 years old, that 1996 Packers team brought an end to a real drought, about 30 years. From the Packers win in Super Bowl II, it was 29 long years, and dozens of quarterbacks, before the Packers would return to the Super Bowl named for the legendary Packers coach. That 1996 team seemed like a team of destiny (but so, I thought, did the 2004, 2011, and 2014 Packers). They had been getting better each year prior to that season, but for three years in a row saw their season end in Big D, against the Dallas Cowboys. Dallas would win three Super Bowls between 1992-1995, ending the Packers year from 1993-1995. Each of those years, the Packers had to play at Dallas, never once getting the Cowboys up to Lambeau and the frozen tundra. The Packers had the NFL’s number one offense, and number one defense. And they didn’t have to travel to Dallas in the post-season. Dallas actually had to travel to Carolina in the NFC Divisonal round, and they lost. The 1996 defense only allowed 210 points all year, 13.1 per game. The offense scored 456, 28.5 per game. Both led the league. In the post-season, the offense put up 35, 30, 35 to bring back the trophy to Green Bay. The path wasn’t as easy as it seems now, looking back. The Packers and Chiefs did, in fact, meet in that 1996 season, and the Chiefs won, ironically enough. It goes to show you, remind us, that glory is usually only written in January and February. Sure, the Packers came out of the gates on fire. They had been many experts’ Super Bowl favorites, including Sports Illustrated. The Packers opened the year putting up 34, 39, and then 42 points in route to a 3-0 record and a 115-26 overall scoring differential. Then came the annual nightmare in the Humptydome in Minneapolis. The Vikings pulled off another upset of the Packers in that hell hole, 30-21. Green Bay was a 6.5 point favorite, but that didn’t matter. Brett Favre always struggled in those years inside that fake-noise, plastic stadium. Minnesota out-time-of-possessed the Packers 38-22, out-first-downed the Packers 18-8, yes just eight first downs. From 1992-1996, this was typical scene in the Metrodome for Favre. John Randle was a load, almost like a hyped-up Mike Daniels. Favre and the Packers were 1-11 on third downs. The Vikings were 9-20. After that week four stumble in Minnesota, the Packers offense got back on track. They won at Seattle 31-10 in week five, then went to Chicago and won 37-6. Things were back on track at 5-1, after three straight road games. They were now set to return to Lambeau and host the perennial Super Bowl contending 49ers, led by a great defense. The Packers got lucky in that Elvis Grbac was the starter at QB with Steve Young missing four starts that year. The winner of this Monday night showdown would get the #1-seed in the NFC. Each team went 12-3 in their other 15 games. This game was the game of the season. But it proved very, very costly to the winners, the Packers. Pro Bowl wide receiver Robert Brooks went down early with a torn ACL and patella tendon. Yes I am still bitter about this play -where Robert Brooks went from All-Pro, young WR, to a spectator for the rest of the year, and never himself again. He would not return for another year, and he’d never be the same. 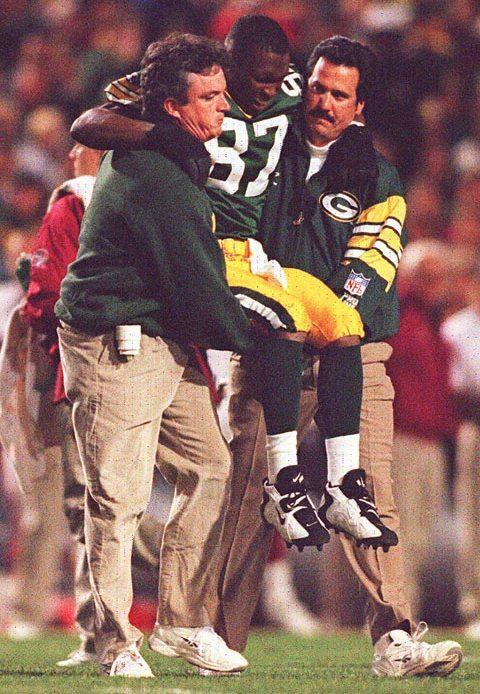 Just like two years earlier with Sterling Sharpe, the Packers lost their top wide receiver. Behind two first-half touchdowns from Jerry Rice, the 49ers led at halftime 17-6, and things looked bleak for the Packers. Don Beebe surprised the 49ers for a deep one, scoring in the third quarter on a 59-yard touchdown play, from Favre. Beebe had 220 yards on the night, filling in for Brooks, and picking up the slack for the slower Freeman, who caught just 6 passes of 18 attempted to him. Favre was also 0-5 on passes attempted to his favorite tight end Mark Chmura. Chris Jacke made his fourth field goal of the game to send the game to overtime. In overtime, the Packers defense forced a 3-and-out, and a shank punt of 31 yards gave the Packers the ball at their own 44-yard line. Three missed Favre passes later, combined with a 3-yard run from Levens, a 5-yard pass to Derrick Mayes, and a 13-yard pass to Beebe, the Packers attempted a 53-yard field goal from Jacke. He was clutch, and the Packers won. After that highest of highs, and lowest of lows (Brooks lost for the year), the Packers’ offense was not the same, stumbling to find their mojo without their deep threat, #87. Sound familiar? Following a bye, in which coach Holmgren hoped to be able to devise a way to overcome the loss of Brooks, the Packers came out and scored just 13 at Tampa Bay, and then 28 at Detroit. They won both games, moving to 8-1 and seemingly in control of the NFC. Don Beebe took this kickoff back for a touchdown in Chicago. However, the next two games were road games, first to Kansas City. The Chiefs slowed down the Packers and won, 27-20, dropping the Packers to 8-2. The next week, the Packers returned to Dallas again, and were smothered 21-6. The offense was atrocious, missing Antonio Freeman as well as Brooks. They were shutout until a final quarter touchdown pass to Derrick Mayes. The offense totaled 254 yards, converting just 4-15 third downs. Terry Mickens was Favre’s top target, throwing 10 passes his way. It resulted in just 38 yards. Beebe was no better, catching just one 10-yard pass on six targets. The Dallas defense bottled up the Packers offense, missing it’s top two WRs in Freeman and Brooks. 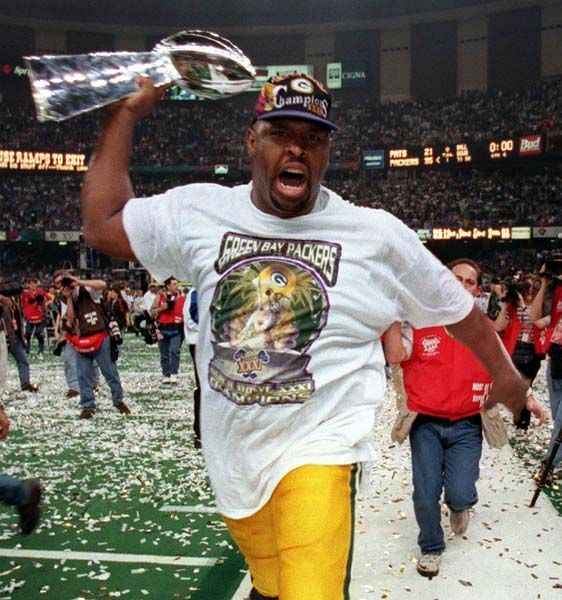 This would be the last time the Packers would lose in the 1996 season. The Packers defense did its’ part, holding Emmitt Smith to 76 yards on 20 carries, and Michael Irvin to 66 yards. But this offense was no longer a championship offense. They were a weakness. In came Andre Rison. In a bold, aggressive move, GM Ron Wolf felt like adding the veteran WR was a smarter call than relying on someone off the practice squad. From Dallas, the Packers traveled to St. Louis, and fell behind 9-0, looking ugly in the process. The defense, however, was a championship defense and they kept the Packers in the game, despite Favre’s struggles. After a Chris Jacke field goal closed the score to 9-3, cornerback Doug Evans came up with a pick-six and gave the Packers a 10-9 lead early in the second half. Two short touchdown passes later, one to Keith Jackson and the other to Levens, gave the Packers a much-needed win, 24-9. The defense pitched a shutout after Favre’s safety gave the Rams a 9-0 lead in the 2nd quarter. The Packers, of course, would not lose again. And the offense came around, bolstered by both the addition of Rison, and the return of Freeman. They scored 28, 41, 31, 38, 35, 30, and finally 35 the rest of the way. But it was the defense that was killer. Over the final eight games, they never allowed more than 17 points, until the Super Bowl when they allowed 21. People forget how good Dorsey Levens was. Heck, Holmgren forgot a year later in the Super Bowl, when Denver could not stop him, Holmgren did. They peaked in a December game at home against the Denver Broncos. John Elway was out, and Billy Musgrave was no match. The final score was 41-6, and the Packers held Terrell Davis to 54 yards on 14 carries. Freeman was back in full force though, scoring three touchdowns and going for 175 yards. Week 17 was a game the Packers needed to win to get the number one seed, and the Packers welcomed the jealous neighbors from the west, Minnesota, to Lambeau Field. Favored by 11 by the Vegas oddsmakers, the Packers rewarded their backers with an easy 38-10 blowout over the 9-6 Vikings. Rison, Levens, and Jackson each caught touchdown passes from Favre, while Edgar Bennett rushed one in early, and Levens added a finishing touch with an 11-yard touchdown run to close out the scoring. The offense was back with 29 first downs and 440 yards. The playoffs began with a rematch with the 49ers at Lambeau. 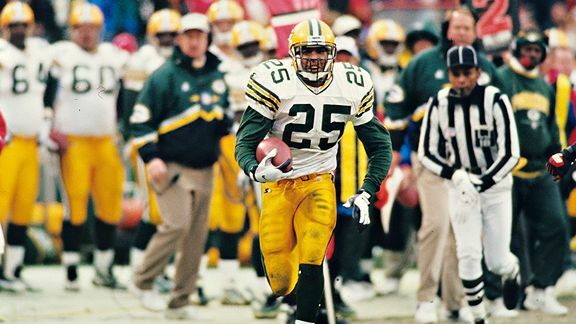 In icky weather, the Packers won easily 35-14 with Desmond Howard starting the scoring with a 71-yard punt return. Rison and Bennett added touchdowns in the second quarter, and the Packers were up comfortably 21-0. Edgar Bennett rushes for a touchdown against the 49ers. But this was all about the defense, again. Steve Young tried to play, but wasn’t able to make it past the first quarter. Grbac was no championship quarterback. Amazingly, Favre was just 11-15 for 79 yards passing. And the Packers won by 21. Sidenote from this game: Youngster Terrell Owens had zero catches on 6 attempts his way. The next week, in bitter cold, the Carolina Panthers were the NFC Championship game opponent, not the Dallas Cowboys like a year prior, when the Packers had a lead entering the fourth quarter, but in Dallas. This lack-of-revenge opportunity disappointed the defense and the fans, to an extent. They wanted the aging Cowboys on the frozen tundra for once. But it was the Panthers instead. The Packers actually trailed Carolina at the end of the first quarter, 7-0. Favre and the offense kept shooting themselves in the foot with penalties, and a Favre interception by Sam Mills. Eventually, the ground game wore down the Panthers. Levens rushed for 88 yards on just 10 carries, while Bennett gained 99 yards on 25 carries. Favre threw for 292 yards on 19-29, with two touchdowns against the one interception. Freeman and Levens caught the touchdown passes. Incidentally, the Panthers were led on offense by quarterback Kerry Collins, who still remains the last Big Ten quarterback to be a first round draft pick. True, Tom Brady, Russell Wilson, and Drew Brees have a combined nine Super Bowl appearances and six rings between them, but genius NFL scouts and GM’s didn’t see either of the three as first-round worthy. Titletown, USA was once again, finally, THE mecca in the world of sports. After the emotional win over the Panthers in the NFC Championship game, the Packers celebrated like it was 1999. Their fans did as well. It had been a lifetime, nearly 30 years, since the Packers made it to the Big Game. Bill Parcells and Bill Belichick’s New England Patriots awaited the Packers in Super Bowl XXXI. That game was a microcosm of the Packers season, and their five-year climb really. Favre and Rison made defensive coach Bill Belichick’s pass defense look like amateurs early when they connected for this simple long touchdown pass to open the scoring. The game started great for the Packers as they scored early on the deep audible to Rison, then added a field goal and led 10-0. But QB Drew Bledsoe hit Ben Coates and Keith Byars for short touchdowns, and the Packers were down 14-10 entering the second quarter. Favre found Freeman, as Packer fans all remember, for an 81-yard touchdown and the Packers led again, 17-14. A Chris Jacke field goal, and a Favre two-yard run to the edge, and the Packers led again 27-14, seemingly comfortable. But the Patriots persevered and scored, making the game in doubt again, at 27-21 late in the third quarter. Desmond Howard immediately sealed the deal by taking the ensuing kick back 99-yards, and the rest is history. Of course, Reggie White added daggers of his own as he recorded a hat trick of sacks on Bledsoe. New England wouldn’t score again after the third quarter, and this defense really led the way to the Super Bowl. Yes, Favre had his share of highlights and big plays. His passer rating, however, for the season was 95.8 and he threw 13 interceptions. Remember that when people are dissing Rodgers’ season last year. Twenty years is a long time. Five years seems like a long time. The lesson in all of it is this: enjoy the journey, which means each game along the way. While Desmond Howard was the Super Bowl MVP, for the season, Don Beebe averaged 26.9 on his 15 kick returns (403 yards), to Howard’s 20.9 (460 yards). Howard returned every single punt, taking not one or two, but three back for touchdowns. That’s in addition to his critical kick return touchdown in the Super Bowl. Realize this: Howard, Beebe, and Rison were all non-drafted acquisations by Ron Wolf, as was Reggie White, Sean Jones, Santana Dotson, and Gilbert Brown. Those four were the starting defensive line in Fritz Shurmur‘s 4-3 defense, for the Super Bowl. Favre, Eugene Robinson, and LT Bruce Wilkerson were also added via non-draft picks, as was lethal tight end Keith Jackson. While Wolf was much more aggressive outside the draft than current GM Ted Thompson is, each resulted in only one ring for the era. But Wolf’s team did make it back to the Super Bowl a second time, with the defense getting carved up by Terrell Davis. ~It takes unwavering patience to be a decorative painter in Phoenix. There is craftsmanship in this work, more love than labor. Inside high-end homes, interior walls are a blank canvas. An artist slowly brings rooms to life. There are antique finishes. Metallic. Crackle. Stripes. No matter the look, the pace becomes an ungodly crawl. In an eight-hour day, a decorative painter may use only one quart of paint. That’s not the part of Daniel Crookston’s job that tests his patience most. Not really. Inside these homes, clients expect dust and fumes to be contained to one room. That means no air conditioning. Even in July. Artistic flare was of secondary concern. Job responsibilities included masking, prepping and lugging equipment. “Grunt labor,” Crookston calls it. More than anything, Crookston says, he needed a reliable employee he could entrust with his business. Crookston got a referral from his mother-in-law. Some kid from the Church of Jesus Christ of Latter-day Saints, where Crookston also attended. He had never met this fresh high school graduate, never bumped into him on a Sunday morning, but their mothers worked together at a doctor’s office. That was good enough for him. Crookston gave Kyler Fackrell his first job. It paid $10 an hour and lasted 10 months, from June 2010 to April 2011. More than five years have passed. Fackrell went to college, graduated. He got married, had a daughter. He played football, had the game ripped away. 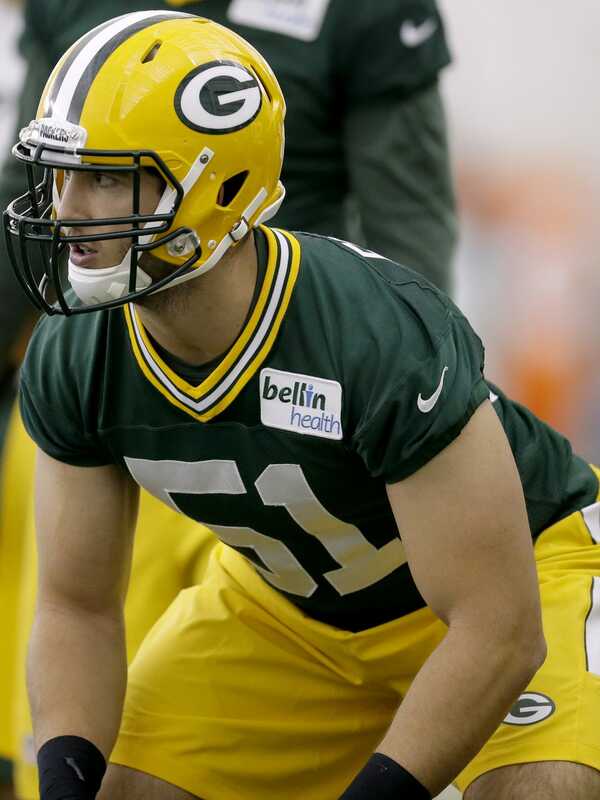 In late April, Fackrell was hired for his second full-time job: outside linebacker with the Green Bay Packers. This gig pays a bit more. The journey from one employer to another was long, winding. No, Fackrell’s patience never wavered. More love than labor, but at times his road just sucked. Some years got pretty crappy. Kyler Fackrell is not your typical rookie. Crookston calls him “a little bit of a novelty.” For so many reasons, he’s right. When the Packers drafted him in the third round, there was no raucous party. Fackrell had a quiet celebration, home with his wife and young daughter. He is a family man first, always. “They’re the motivation for everything I do,” Fackrell says. In a sport that values youth, Fackrell arrived in Green Bay four years older than first-round pick Kenny Clark. He will turn 25 in November. On that day, Fackrell will be the same age as fourth-year left tackle David Bakhtiari. His unusual age is the remnant of a career that started on a different path. There was no coaching brigade waiting to recruit Fackrell out of Mesa High, the fourth-largest high school in Arizona. Though he led Mesa to its first state championship game in 17 years, his only scholarship offer came from Utah State. When Fackrell graduated, he was uncertain where his future would lead. He considered applying to go on a two-year LDS mission that could have sent him anywhere in the world, including his own neighborhood. It was his first adult decision, and Fackrell wanted time to choose wisely. So he got a job. The Packers’ rookie outside linebacker is built for painting. He is tall, standing 6-foot-5. Long arms. Big reach. Ladders are an optional tool. This wasn’t about painting, though. Crookston needed the right personality. Someone who would work hard. Someone who was reliable. Someone who didn’t mind carrying equipment in the sweltering heat. Indoors or outdoors. With or without air conditioning. Crookston first noticed Fackrell’s height — “definitely a bonus,” he says — but honesty and punctuality were the two most important job requirements. Plenty happened during those 10 months. Crookston estimates he and Fackrell painted 60 houses together. DC Decorative Painting was too small for an advertising budget. Clients mostly came through word of mouth. No two jobs were ever the same, Crookston says. Some weeks, he and Fackrell would paint three or four houses. Other projects took a month. Fackrell didn’t have a car at the time. His mother, Lori, dropped him off at the job site before work, or Crookston picked him up at home. They lived 25 miles apart, the distance between Mesa and Queen’s Creek, which isn’t very far in Arizona, where the world spreads out into an empty desert. Round trips weren’t much more than an hour, Crookston says. Crookston doesn’t remember every project, but he says 95 percent of their work was indoors. Fackrell would tape off base boards, ceilings, cabinets. Crookston was a magician with a paint brush. “I think I’ll be able to paint my own walls something uniformed,” Fackrell says. “He taught me a little bit using sponges and texturing the walls and stuff, but it definitely is an art. So it wasn’t me. It was mostly him, but it was interesting just to go through that whole process. An average day kept them within a 30-mile radius. Sometimes, they went abroad. The furthest he took Fackrell was California. They drove up together to one of those big, crazy, cool houses in Glendora, a Los Angeles suburb. It was a major job, demanding full-time service. Fackrell and Crookston lived inside the home for a week, sharing a roof with the owners. “We got to know them pretty well,” Crookston says. Sometime that week, Fackrell opened up about his future. He was at the intersection of life-changing decisions, still weighing whether to go on his LDS mission or accept a football scholarship to Utah State. At week’s end, the homeowners wrote a $100 check. Use this if you go on your mission, they said. A month after California, Crookston asked whatever happened to that check. Fackrell told him he hadn’t cashed it. That day, Crookston says, he learned two things. Fackrell wasn’t going on his mission. And the kid from his church was every bit as honest as his mother-in-law promised. “I learned pretty quickly I could trust Kyler 100 percent,” Crookston says. Fackrell kept working for Crookston. Kept taking jobs close to home. He was growing tired of Arizona. Restless. “I just felt like I was kind of in no-man’s land,” Fackrell says. Crookston remembers Fackrell was a “quiet” kid who didn’t talk much. Football was the one, constant topic. Clearly, Fackrell missed the game. Crookston knew his employee could play. Really, though, he had no idea. Bill Busch had a clue. At the time, Busch was Utah State’s defensive coordinator. John Shea, Fackrell’s high school defensive coordinator, had been a graduate assistant with Busch at Northern Arizona in the mid-1990s. Shea thought Busch would be interested in Fackrell, an athletic, 215-pound safety, and he was right. The more Busch researched, the more he liked. Fackrell excelled at everything. When he wasn’t playing football, he earned all-region honors in basketball and volleyball. “He had the things you can’t coach,” Busch says, “and that was size, long arms. He was just an incredible athlete. The thing that stood out the most was a sixth sense with his athleticism. When he played other sports, in those different positions, you could tell he was just hooked up right. In the spring of 2011, Fackrell bet his future on football. He packed his bags and moved in with his uncle, who lives outside Salt Lake City. He got a part-time summer job at HandStands Warehouse, a receiving company that sold car fresheners. Fackrell unpacked pallets of boxes because he didn’t have his forklift registration. His attention was focused on Utah State. Its campus sits in Logan, Utah, a mountain town 20 miles south of Idaho. Far from big cities. Even farther from college football’s spotlight. 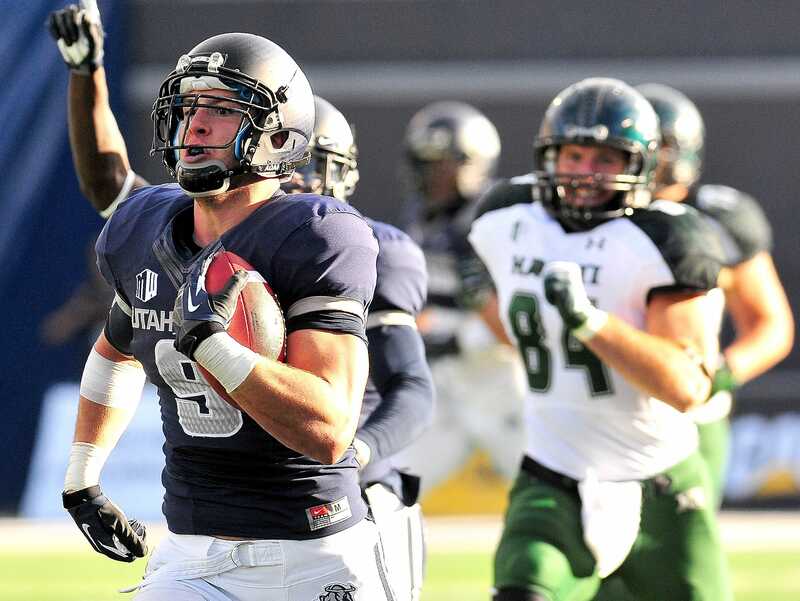 Utah State recruits its region, so it’s common for them to sign players of the Mormon faith. With players arriving and leaving from LDS mission fields, scholarship numbers regularly fluctuate. Fackrell was recruited as a scholarship player, but he had to walk-on initially and wait a few months for a scholarship to become available. In the meantime, Fackrell quickly impressed his new coaches. From afar, he spent the summer working in the Aggies’ weightlifting program. Fackrell would sip protein shakes for breakfast, lunch and dinner, trying to gain weight. When he arrived at Utah State, Fackrell says, he was 200 pounds. Busch thought Fackrell might make a good tight end. When he pitched the idea in a coaches meeting, offensive assistants weren’t interested. Good, Busch thought. More talent for him. He placed Fackrell at outside linebacker and turned him loose. “It worked out pretty good,” Busch says. After almost two full years away from the field, Fackrell remembers, he felt raw. Fackrell had never played full-time on the edge. He needed to master this craft, just as he learned how to hold a paintbrush. It didn’t take long. Fackrell didn’t play his freshman season, though Busch says he “easily” could’ve contributed. He was surprised how quickly Fackrell learned his position. If he had rust, Busch thought, it didn’t show. Really, though, Busch had no idea either. He didn’t foresee Fackrell becoming a legitimate NFL prospect, not in that first season. If he did, Busch reasons, Fackrell wouldn’t have used his redshirt. Even Fackrell arrived in Logan with no grand expectations. By 2014, Fackrell made his transition from decorative painting to NFL prospect. He had five sacks and 13 tackles for loss as a sophomore. Agents started introducing themselves the next summer. Utah State started its 2014 season with a trip to Tennessee. It was a chance for Fackrell to showcase himself on a big stage. In the second quarter, it went horribly wrong. A Tennessee player carried the football on the other side of the field. Fackrell tried to pursue, but a blocker grabbed his facemask and pads. When Fackrell planted his right leg to cut one way, the blocker yanked him another. His right knee “tweaked” when he stepped. His knee barely hurt, Fackrell says. It felt loose more than anything. There was no swelling. Doctors examined Fackrell’s knee on the sideline and allowed him to return the next series. Fackrell immediately recognized his knee wasn’t healthy enough to play. When he braced to take on a pulling guard, his right leg felt like it was stepping in quicksand. Fackrell left the game for good. Two days later, he learned his ACL had been torn. Fackrell refused to buckle. This was the kid Crookston hired. No nonsense. Reliable. Fackrell could’ve sulked. Instead, he stayed patient. If Fackrell had to take a break from the game, this was a good time. His wife, Elizabeth, was five months pregnant with their now-2-year-old daughter, Delaney. It was a rough pregnancy, as morning sickness goes. Nothing life threatening, Fackrell says, but Elizabeth was in and out of the hospital with dehydration. Fackrell would’ve been preparing for the NFL combine when his daughter was born. The need to prepare for his family’s future would’ve pulled him away. Looking back, he calls the torn ACL a blessing in disguise. Never, Fackrell says, did he doubt whether he still could reach the NFL. Fackrell relived his past few years earlier this week after an organized team activities practice. His locker is between Julius Peppers and Nick Perry, two former first-round picks. Their paths are familiar to NFL fans. Blue-chip high school prospects. Big-time college football programs. Darlings of their draft. No, Fackrell never took that route. His journey feels long, winding, even if he never doubted. 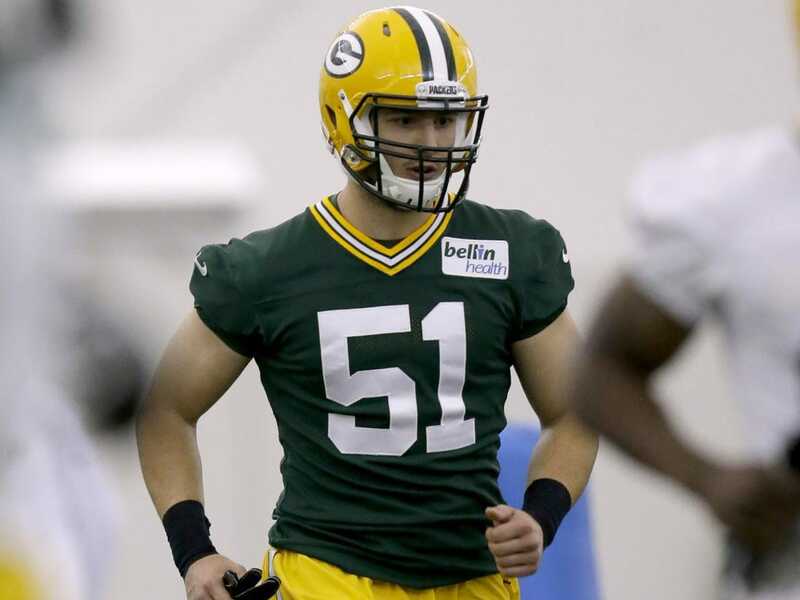 He hopes to crack the Packers’ outside linebacker rotation this fall. He hopes to contribute early as a pass rusher, because he knows he can. Right now, during these OTAs, Fackrell will be happy to make a good first impression. Already, coaches have noticed. Listen closely, and Moss sounds a lot like Crookston and Busch, praising a hard-working kid whose patience brought him here, whose work ethic will do the rest. ~Pre-draft mocks. Post-draft grades. They mean nothing. Only time can judge who was a good pick, and where they belonged to be drafted. Period. Not Mike Mayock, not Mel Kiper, not Todd McShay, not the folks at CBS Sports, Fox Sports, USA Today, Draft Countdown, Walter Football, or anyone else on Twitter or anywhere. 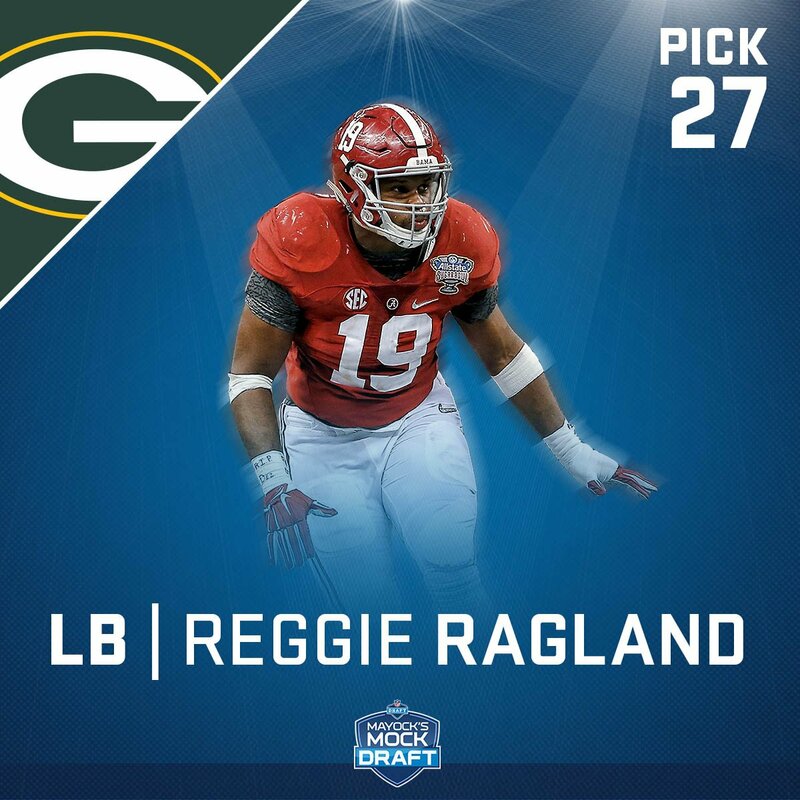 Many Packer fans wanted to hear the name Reggie Ragland called at pick #27. 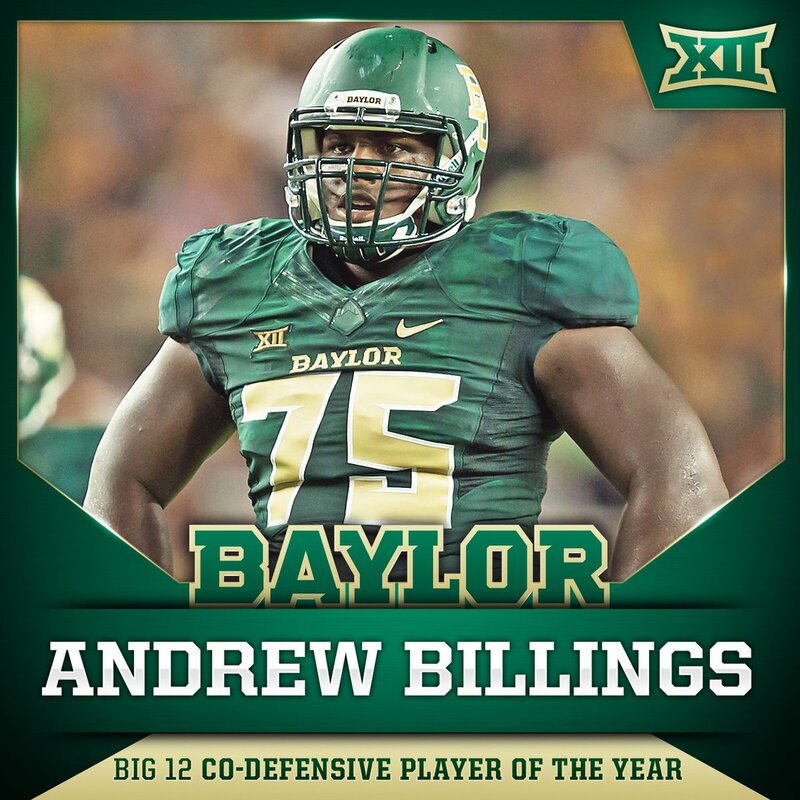 Some wanted to hear Andrew Billings, even though he would have been available with the Packers third round pick, amazingly. Ted Thompson has heard of those players. He’s met them. He’s scouted them. He’s talked to them. He’s talked to coaches of them, and coaches against them. He’s seen more film on them than any of us, and he has talked to his scouts who also have met these players. Ted knows more than we do. Now, that doesn’t mean he’s right. That doesn’t mean he doesn’t make mistakes. Defensive lineman Jerel Worthy was Thompson’s second round pick a few years ago, and Thompson traded up for him. Thompson also used the #16 overall pick on Justin Harrell, who I had graded as a second rounder, and whom 90% of Packer fans were mad about the moment his name was called. Thompson also selected a defensive end out of Purdue in the second round a few years ago named Michael Neal, who the consensus had as a 4th-6th round pick. That pick also hasn’t worked out. But Kenny Clark gets my endorsement. And that’s despite the fact that I admit that I would have selected Ragland, and done so within seconds of him not being taken at #26. However, I have never met either player, and never talked to either player’s coach or opponent’s coaches. He moves easy for a big guy. He has brute strength. He’s the team captain for the UCLA Bruins. He’s only going to be a 20-year old rookie. I like this pick, Gruden said. He added a pass rush to the equation. I thought he took his game to another level. Kenny Clark. “The defensive line has to set the tone.” I think Mike Daniels likes that thinking. I think Mike Daniels is going to love being on the same defensive line as Clark. These guys are going to wreak some havoc for opposing offensive lines, quarterbacks, running backs. Ted Thompson gets the benefit of the doubt from most pundits, because his track record is pretty good. It’s not the best. But it’s pretty good. If you believe in Thompson, then you love this new defense with Clark joining Daniels and Letroy Guion as disruptors, predators, big nasties in the trenches. Daniels said a defense can’t be great with a bunch of nice guys. That’s true. And these guys, these three in particular, have some big nasty in them. I think Kenny Clark will be every bit as good as B.J. Raji ever was, and I loved Raji coming out of Boston College. Raji was the #9 overall pick, and it was a 50-50 that he’d even slide that far. He measured in at 6-1 1/2, 337, with a 5.23 40-yard time, 3.02 in the 20, 1.82 in the 10-yard dash. His 20-yard shuttle was 4.69, his 3-cone was 7.9, and the Big Freezer did 33 big reps of 225 Lbs. which is mighty impressive. Clark measures 6-2 1/2, 314, with a 5.06 40-yard time, 2.90 in the 20, 1.72 in the 10-yard dash. His 20-yard shuttle was 4.62, he didn’t do the 3-cone, and he did 29 reps.
Raji, despite about 20 more pounds on his frame, actually had a bit higher vertical and broad jump. But Clark is quicker as shown in each category, and he’s just about as strong. Now, Raji is out of football, as he turns 30 this summer. 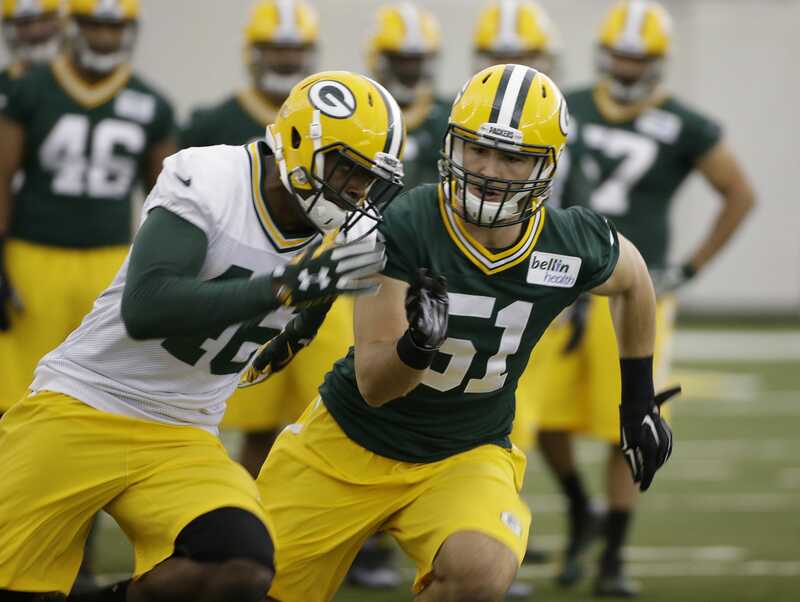 Clark is only 20, so the Packers have gotten much younger and fresher on the defensive line. They’ve also hopefully gotten better. But, as always, only time will tell because it takes time for anyone to accurately judge a draft. That doesn’t stop the internet geniuses from handing out their grades of Thompson’s work. Donald Trump hopes to make America Great again, erasing numerous severe errors that this country has made the past 10-15 years, here and all over the world. 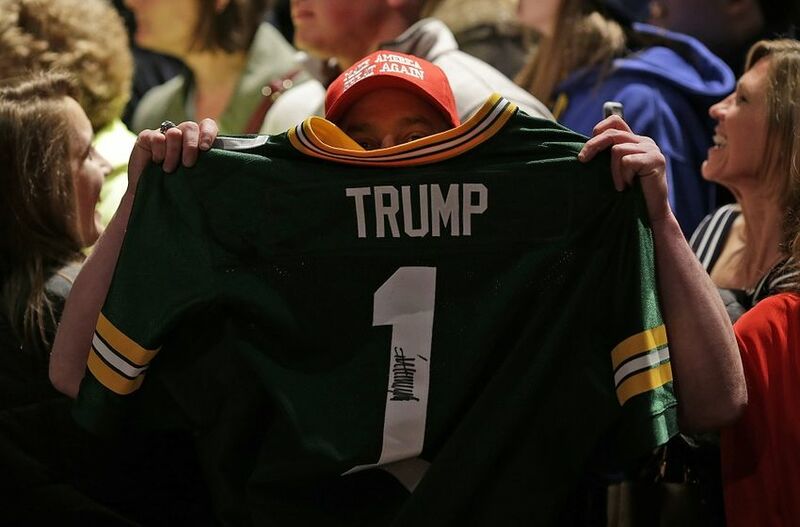 Packer fans hope Clark can help make the Packers defense great again. I think he can. But only time will tell. Stay tuned. ~It’s never too early to look ahead. That’s all we have really, between now and September. The good news is September is now only four months away. Obviously a lot of things will happen between now and then, and between September and January. Position battles will play out. There will be some rookie surprises not only making teams, but having impact early. There will be some high picked rookies who do little to nothing. There will be some big name rookies who don’t do much, but they’ll still make the All-Rookie team based on their name. Alabama players tend to get that. I’m basing this on players I see getting starts, and having some impact as rookies. I don’t do place kickers or punters. Notes: I think Goff is the most ready, and has a fine offense around him with the stud back in Gurley taking pressure off, giving him some shots to open guys. For Dallas to justify taking Elliott, they need to get 1500 yards from him. It’s possible if he doesn’t get injured. I think the big man Derrick Henry will supplant Demarco Murray early in Tennessee, and run well. He reminds me of former Titan Eddie George. And in Denver, Booker has a chance to be great. Denver already has good backs, including CJ Anderson. But Booker is a stud and if given playing time, could be a difference-maker for Mark Sanchez. Who? Maybe Sam Bradford. Colin Kaepernick? Josh Doctson is fantastic. If Kirk Cousins plays well again, Doctson could lead all rookies in catches, yards and touchdowns. I think Doctson has a chance to be the Offensive Rookie of the Year, although Elliott already has one hand on that trophy. Josh is sensational. He’s a future Pro Bowler. Shephard and Miller being the jack of trades, in the mold of last year’s rookie stud WRs Lockett in Seattle and Diggs in Minnesota, won’t take long to have impacts. There will be more impact guys on defense than on offense from the 2016 rookie class. That’s not surprising given the fact that the draft was top-heavy on defense. 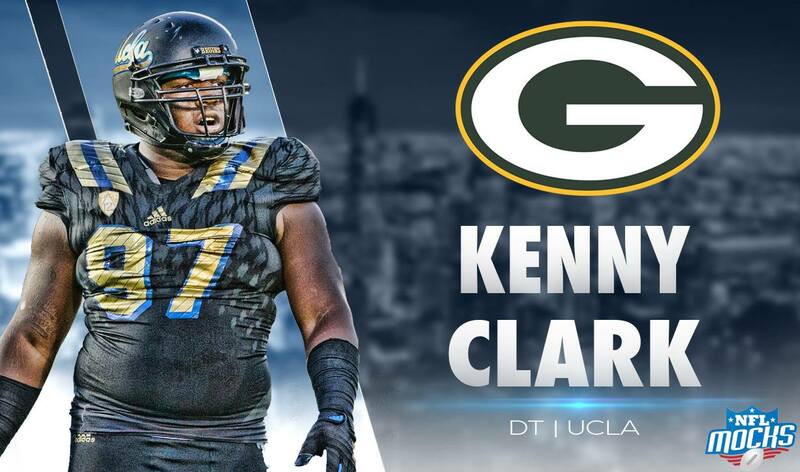 Kenny Clark will make Packer fans forget about BJ Raji. Jacksonville has a bunch of new guys on defense who will make that team better. That is, after a week one loss to Aaron Rodgers and the Packers. Their first five picks were all defense: Ramsey, Myles Jack, Ngakoue, Day, and Tyrone Holmes, OLB. Jack won’t play this year probably, but they should get back last year’s top-five pick Dante Fowler, who tore his ACL immediately in training camp. While he shakes off the rust in that knee, both rookies will have an immediate impact for Gus Bradley’s pass rush, as will Sheldon Day from the line. Whoever wins the playing time between Holmes and Ngakoue will put up some nice numbers. They have the looks of a good defense very soon. Eli Apple will shine in the Big Apple early, until the refs start to flag him for his repeated molestings. But that’s how a CB rises to the top. It worked for Richard Sherman and Aqib Talib. Reggie Ragland will make some Packer fans mad that they passed on him. 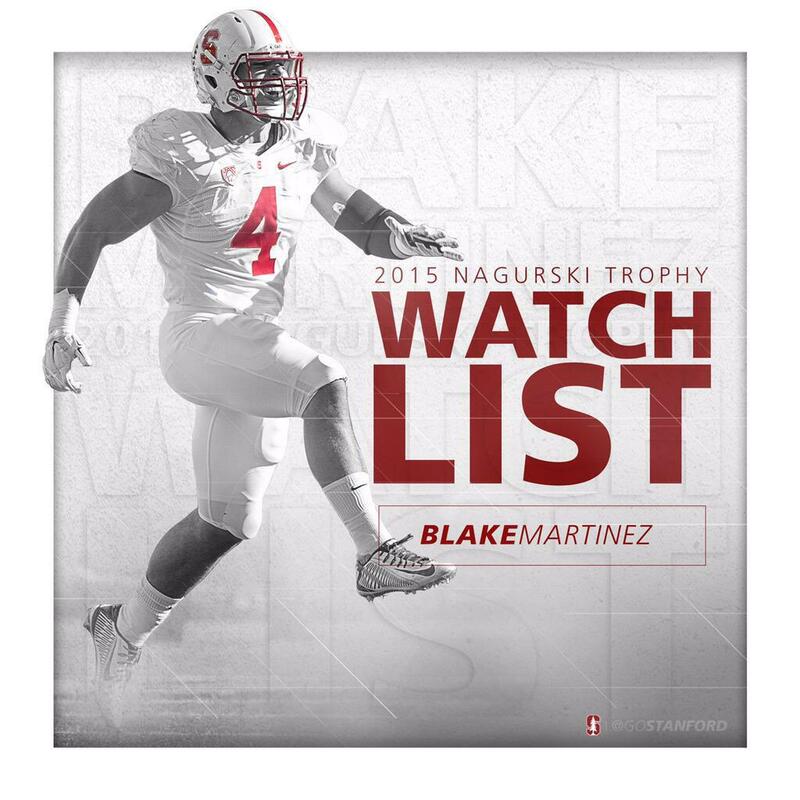 However, Blake Martinez will also shine. Buffalo will get a big spark from their dynamic duo of Shaq Lawson and Reggie Ragland. Ragland will be an instant stud anchoring the middle of that defense. He’ll draw comparisons this year to Brian Urlacher of the Bears as he’ll be in the middle of numerous turnovers, in addition to his run-stuffing. Don’t forget about Kevin White and Dante Fowler. They were premium top-ten picks last year who never played a down. Each missed the whole season with early injuries. Now usually it takes a player an extra year to recover and trust his knee. And these guys are basically rookies. Will either light it up as basically redshirt freshmen? ~Ted Thompson is among the best as a draft navigator. Along with New England, Seattle, Baltimore, and Minnesota recently, Thompson seems to come away with one of the best draft classes every year. Packer fans, we hope this year is no exception. I like Kenny Clark and Blake Martinez. I think those two guys will make this team better, this season. I’m not so sure about Kyler Fackrell, Dean Lowry, Trevor Davis, and Kyle Murphy helping make the team better, this year or beyond. Davis has speed. Fackrell might be a good cover-backer, but not sure if he has the athletic ability to beat NFL offensive tackles. Only time will tell. Jason Spriggs has some upside, but there are some mixed opinions of him from scouts. Clearly, Thompson believed the rave reviews as he traded three picks for him, reducing his draft class from nine to seven. I would not have done that. But I also, admittedly, would not have traded up in 2009 and taken Clay Matthews. And I would not have traded down in 2009 and 2006 and selected Jordy Nelson and Greg Jennings, and without any of those moves that Thompson made, there’s no Super Bowl XLV. But Thompson has made his share of mistakes. As first round picks, Justin Harrell, Nick Perry, and Datone Jones didn’t make the team better. Harrell was a bust. Derrick Sherrod was another first round pick, 2011, who was a total bust, but that’s 100% on injury, not on Ted or his scouts. Jerel Worthy as a trade-up and take in round two was a bomb. Michael Neal as a second round DE pick was a failure, and he was projected as a day-three pick, not a second rounder. Thompson also traded up to select Terrell Manning, thinking he was the future at inside linebacker. Anyway, here is how I would have drafted. Now sure, I did my pre-mocks, and doing that is all guess work because you never know who will be picked where. Did you know Laremy Tunsil would slide down to the 13th pick? But this is how it actually played out, how the board went. And this is who I would have selected in each spot based on what really transpired in Chicago. And I would not have traded up in round two to take Spriggs, sacrificing one of our fourth and seventh round picks to move up for him. Note: Yes I know how it played out with Billings, that I actually could have taken him at pick #88, but when the #57 pick was on the clock, I would have not known that at that time, so realistically, I would have taken him then. Mike Mayock had Reggie to the Packers. I believe what Rex Ryan believes. Rex grabbed him in the second round after he took his pass rush edge guy already in round one with Shaq Lawson. I think Ragland is the enforcer in the middle that the Packers have been missing. The type of leader in there like Carolina has with Luke Kuechly, and the Niners had with Patrick Willis when they were great and eliminating the Packers in 2012 and 2013. Many had Billings as the Packers first round pick in their pre-draft mocks. Who knew he’d be able to be taken by the Packers with their first, second, or third picks? Only time will tell who’s better among Billings, Kenny Clark, and the Alabama guys A’Shawn Robinson and Jarran Reed. But I believe Billings would have made the Packers defense better immediately. I think he’s a BJ Raji clone, but with fresher legs. 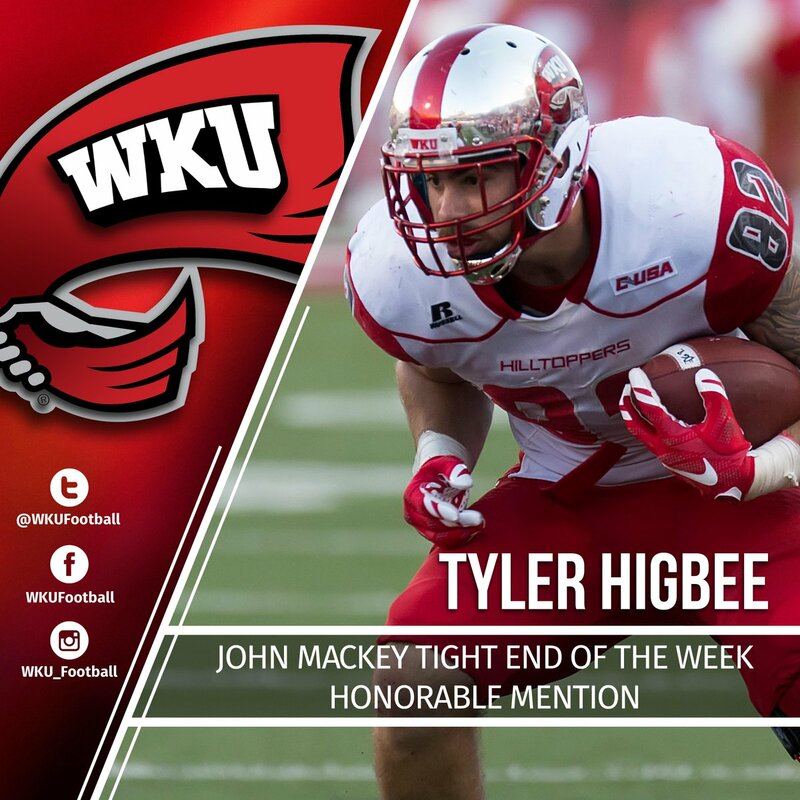 Higbee reminds many of Tyler Eifert of the Bengals. On the field. His issue with alcohol off the field is the worry. This guy is a knucklehead off the field, and perhaps that’s why Thompson did not select him. But Thompson signed Jared Cook and he’s more of a knucklehead with his support of the radical racist movement in Ferguson Missouri. Higbee has the best blend of size and speed among all tight ends in this class, including Hunter Henry. This is a pick I wouldn’t change at all. The Packers weakness has been coverage from linebackers, and all indications are that Martinez is as good as any in this draft class. Pro Football Focus graded Martinez as the best inside linebacker in coverage from the whole draft class. He’s also good against the run and blitzing. And he’ll be a great special teamer right away. This was a pick Thompson made that I live as well. This guy will make a name for himself. He has first round talent. 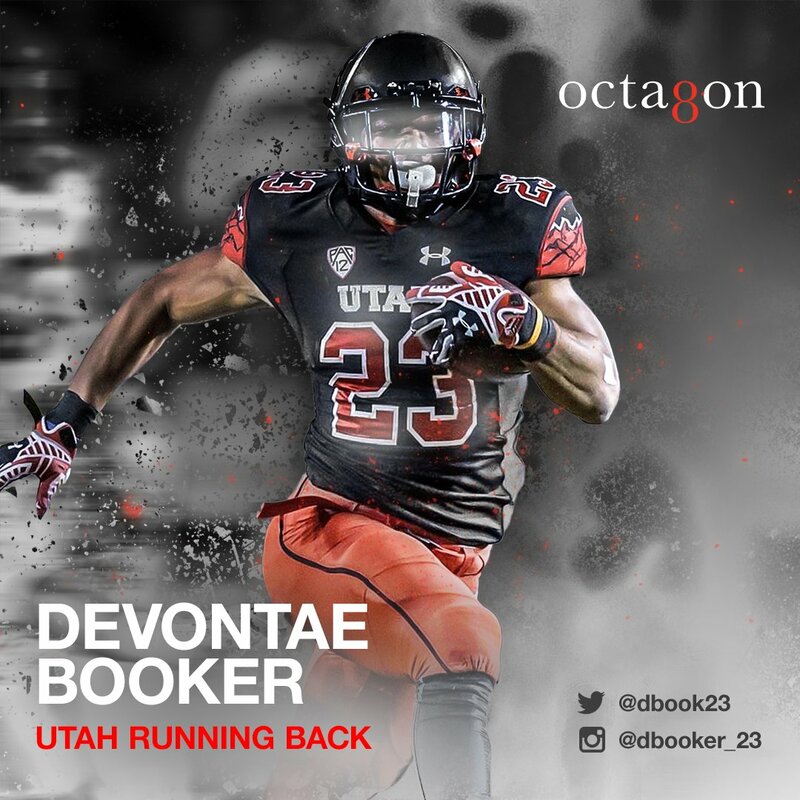 Booker is an all-around RB that is physical, quick, catches the ball out of the backfield, pass protects, and he’s strong. He reminds me of a young Jonathan Stewart of the Carolina Panthers, who was a first round pick out of Oregon about eight years ago. Haeg performed well, fits the profile, and already looks good in Green & Yellow. He’s won five national championships blocking for Carson Wentz and Packers running back John Crockett. I think he’s better than Kyle Murphy, whom Thompson selected on day-three, but I hope I’m wrong in the end as Murphy might be needed next year. Haeg fits the profile that Thompson looks for on his offensive line. Carson Wentz may have been the best offensive player in all of FCS. But Holmes was the best defensive player. I’d take Holmes over Fackrell, whom Ted took two rounds earlier. Again, I hope I am wrong and the genius Thompson proves to be right yet again. A smart, hard-working, high-effort player who fans and coaches will love. Impressive pass rush success with 18 sacks in 2015. Has everything you’re looking for in an edge-rusher. Size and speed are ideal, effort and intensity are never questioned. He will make Nick Perry expendable after this season. Zettel went to the Lions, so Packer fans will get to see him over the next few years twice a year. Hopefully now nobody notices him. A team captain and emotional leader at Penn State. He is relentless and competitive with flashes of rush ability. He’s not quite as tall as Lowry is, but I think he offers the Packers just as much as Dean will give. A nice rotational piece on the defensive end for Capers. 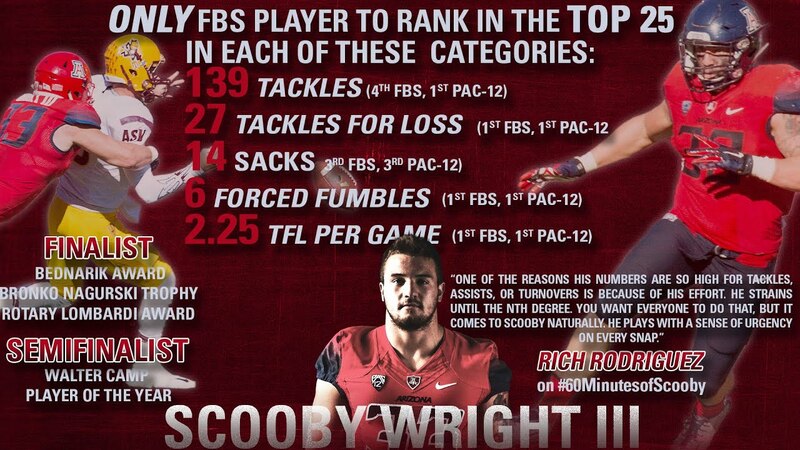 Just like a few years ago when I knew Chris Borland could play well in the NFL despite his “short” stature or lack of great speed, it’s clear to be that Wright will be a good NFL linebacker. A few years go, Vontaze Burfict, another Pac-12 inside linebacker, slide out of the draft because, partly, of his lack of speed. He’s turned into a good linebacker obviously, although he’s a knucklehead. Wright is no knucklehead. Back before he got injured this past season, Scooby appeared to be a lock for a day-two pick, probably a second rounder. He didn’t have to turn pro, and may not have had he known he’d slide to the bottom of the draft. Team captain with great instincts and tremendous production at MLB despite below-average pass coverage ability. Likely a future starting two-down LB and special teams contributor. At worst, he’s Chris Borland, but an inch taller. At best, he’s Mike Singletary. You might be thinking that there are too many inside linebackers with three being selected. But let me ask you this: How many current Packers do you think are quality inside linebackers? Are you comfortable with Jake Ryan and Sam Barrington? How about in coverage? Blake Martinez is a better cover inside backer than any of them. Joe Thomas? He’s about 220 pounds, and short. I’ve never seen anyone as lost as he was last year in coverage. I love Carl Bradford, but we’ve yet to see him out there. I believe Ragland can cover well. Wright, not so sure. But I think Ragland, Martinez, and Wright would immediately be the best three ILB’s on the roster, making Ryan and Barrington get better or not play. Barrington is coming off of a serious foot injury that’s been mysterious. Ryan looked atrocious in coverage. You don’t want him on the field when the offense isolates him covering a fast running back or tight end. You saw that last year. Anyway, I feel this way many times following a Packers draft. Quite often, I’m proven wrong as guys like Jordy and Jennings, Nick Collins and Damarious Randall turn out great. Hopefully, this is the case again with this draft class. But if I was in charge, this is what would have played out. Now, we have to check back in a year, three, five, and see the results. Hopefully, Mr. Thompson is proven to be the genius that many call him.